Derriaghy Cricket Club are continuing preparations for their first season back in the Ulster Bank Premier League which starts on 30 April. Pre season friendlies away to Muckamore and Downpatrick have been lined up for weekend 23/24 April although a lot will depend on an improvement in the current wet spell we are having. Like most grounds around the country their Queensway pitch has suffered this winter and much of the normal spring preparation work is way behind schedule. 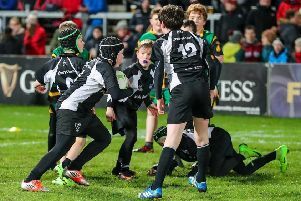 The weather will not deter their youth section getting started with Junior Registration evening planned for Monday 11th between 6.30 and 7.30pm. This gives the opportunity for parents of both existing children and any new members from P2 upwards to come along, speak to coaches and register for the season which runs until late August. Outdoor training for all youth players begins on Monday 18th with primary school children between 5.45 and 7pm while older age groups run from 6.45 to 8.30pm. For more information go to the club website or call 07717492360. The local club coaches have begun work in schools around the area and will continue throughout the school summer term. Later in the month Indian player/coach Kaushik Aphale will be available to assist with sessions.